Open bar while on the boat is included. This is the perfect day cruise for families and groups. 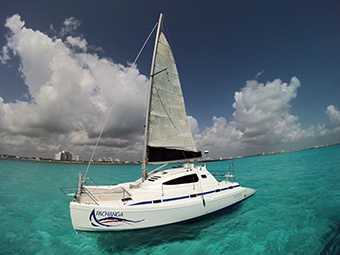 Our crew will take good care of you while sailing to Isla Mujeres and everyone can try the spinnaker flying on the way back to Cancun. We also have larger boats for 16 people up to 90 people. email me for the price of the larger boats. Each person counts, regardless of age. $13 USD per person Sea Life Conservation / Dock Fee must be paid at boarding. Not included in price. Transportation is NOT included. It is easy to take the public bus to/from the marina. The lunch and snorkeling may not be private. Restrooms on board all boats. Pack for this tour: Sunblock, sunglasses, hat, camera, tip money.